As predicted in this column last week, the entrance of Martin McGuinness into the Irish presidential race has electrified what had been an extremely dull election here. It has launched a bitter debate not just about McGuinness's suitability as a president, but about the bloody IRA campaign which he led for so long. Even though it was never concluded or resolved at the time, most people had thought that the debate about the IRA was over, that it had ended with the IRA campaign. For the sake of peace most people had been happy to let it go, to let the issues involved around the IRA/Sinn Fein double act wither away over time. For the sake of peace, it seemed better to swallow hard and say nothing as former IRA men morphed into Sinn Fein politicians who suddenly believed in democracy. In the south, it was never a big deal because Sinn Fein was a fringe party and likely to remain so. But it turns out that this debate is not over. The entry of McGuinness into the presidential election has opened up the argument again. It's back with a vengeance now because it has an immediate relevance for people here. If it wasn't legitimate, it was criminal. We know McGuinness was deeply involved. So depending on your view, that may mean McGuinness was involved in criminality and that would make him an unacceptable candidate for the presidency. Even though it's just begun, the debate already has brought to the surface again some cases of extreme IRA violence that McGuinness was either involved in or responsible for as an IRA leader. With over four weeks of the election to go we can expect that more of these cases will be resurrected. Some of them are so appalling and so hard to justify on any level -- we will mention just a couple of them later -- that one would think they would automatically preclude anyone involved from becoming president. But this debate is not just about McGuinness's personal record. His own record is not the only reason why he should not be president. The wider and more important reason is that electing him president would confer a retrospective legitimacy on the entire IRA campaign. And that is what this is about. That is the main reason Sinn Fein wants to get him elected as president. It's not about giving McGuinness a happy retirement in the splendor of the Aras (on the average industrial wage, of course!) It's about parading the former IRA leader at home and abroad as the face of a new republican Ireland, comfortable with its bloody recent past. Another factor in the Sinn Fein planning is that the president we elect this time will be in office in 2016 when the centenary of the 1916 Rising takes place. Think about that. A Sinn Fein president fronting the national commemoration ceremonies would give a visual reality to the direct link that Sinn Fein and the IRA claim to the men of 1916. It would be a massive publicity boost for them and give a new context of legitimacy to the campaign of murder and mayhem they waged over the 30 years of the Troubles. Overtaking Fianna Fail as the party of constitutional republicanism in the south, just as it has taken the place of the SDLP in the North, has been an ambition of Sinn Fein for the past few years. It used to be a pipe dream. But the collapse of Fianna Fail in the election earlier this year has presented Sinn Fein with a golden opportunity to make the dream a reality. An election of a Sinn Fein president this year would make it easier for a lot of people to vote for Sinn Fein candidates in the next general election in a few years. The opportunity to eclipse Fianna Fail and become the main opposition party has been enhanced by Fianna Fail's shortsighted decision not to run a candidate for the presidency this time. They say they need time to rebuild the party. But with Sinn Fein looming, this is a strategy that makes turkeys voting for Christmas look intelligent. With the present government faced with three years of painful cutbacks ahead, people will be fed up and looking for alternatives by the time the next general election comes. It could be Sinn Fein's big chance. The election of a Sinn Fein president this year is part of this long-term strategy, a plan the party has been working on for some time. They want to be in government north and south of the border, which they believe will make their ultimate aim of reunification easier to achieve. And when that comes about the Unionists will just have to accept the situation! The problem with all this, of course, is Sinn Fein's selective approach to democratic legitimacy, as we have seen in the recent past, not just in the north but in the south as well. This has allowed them to refuse to acknowledge the state, the courts and the law in the south. It has allowed them to murder Gardai (police) and ordinary citizens, to rob banks, import weapons and explosives and intimidate anyone (including juries) who may get in their way. Their certainty not only of the legitimacy of their cause but of its supremacy over the requirements of our democracy makes them different than other political parties here. They claim to have changed and to now fully accept and support the southern state. But for many people here it's much too early to judge whether this is true or not. There needs to be a much longer period of probation. That is the background to what's going on behind the headlines. But it is McGuinness's personal record which has been making the headlines over the past week. Back in the late 1990s McGuinness told the Saville Inquiry into Bloody Sunday that he had left the IRA in the early 1970s. Nobody -- including himself -- believes this. Certainly the British government did not believe it, since they continued to talk to him whenever they wanted to negotiate with the IRA. And the Gardai in the south believe that he continued to be one of the top IRA leaders from the 1970s to the 1990s. His IRA career is so well documented that it's not necessary for me to go through it here again. From his time as a teenage butcher boy (!) in Derry who joined the IRA, quickly rising to take command of the IRA in the city, on to being head of the Northern Command, chief of staff and chairman of the Army Council. Some of the most infamous IRA actions took place on his watch -- Mountbatten, Warrenpoint, Enniskillen, to name just three -- at a time when he led the Northern Command or held an even more senior position. One of the early ones I remember was the Kingsmill massacre in Co. Armagh in 1976 when the IRA stopped a bus, took everyone off, separated the Protestants and executed 10 of them. But it is some of the lesser-known or forgotten individual atrocities that McGuinness was responsible for that have been brought up again in the media here in the past week to illustrate the ruthless cruelty with which he operated, a far cry from his recent Chuckle Brothers act. There was the invention by the IRA under McGuinness's leadership of the "proxy bomb,” long before the Islamist suicide bombers thought of it (at least they blow themselves up, the IRA forced other people to do it). In particular, there was the case of a Catholic man called Patsy Gillespie who worked in a British Army canteen and therefore was deemed to be a "collaborator" (not just a family man who badly needed a job). The IRA held his family hostage while they strapped him to the driver's seat of a van with a 1,000 pound bomb and ordered him to drive the van up to an army checkpoint. They then detonated it by remote control, killing him and several soldiers. Or there was the case of IRA man Frank Hegarty, who had betrayed the location of an IRA arms dump to the British Army. He fled to England and was in hiding but wanted to come home. McGuinness visited his mother several times, telling her Frank needed to return to straighten things out and that he would be okay. When he did come back the IRA kidnapped and murdered him. Mrs. Hegarty never forgave herself for being fooled by McGuinness into luring her son back, and years later when she took part in a TV program telling the story she was still blaming herself. These and some of the accounts of McGuinness's actions in his earlier days in Derry -- tarring and feathering locals or doing punishment shootings to enforce his rule -- show a cold ruthlessness from the very beginning. He was uncompromising and vicious, quickly moving on from attacking British soldiers in Derry to assassinating Catholics who were in the RUC. One story about him that I had forgotten resurfaced in the Irish Independent last weekend, and it's worth relaying because it typifies the absolute ruthlessness with which he operated. This happened in April of 1982 when McGuinness was chief of staff of the IRA but still intimately involved in what the IRA was doing in Derry. In 1982 Joanne Mathers, 29, a mother of a young son, was doing a part time job collecting census forms on a housing estate in Derry. The IRA had ordered people in Derry to boycott the census. Joanne, a Protestant originally from Donegal who had a degree in town planning from Queen's University, was helping a man to fill out his form when she was attacked on the doorstep of a house. A masked gunman rushed up and shot her through the neck. The IRA denied that they were responsible, but ballistics showed that the same gun had been used in several IRA murders. It was a big story for a day or two. But then it was forgotten because a month later Bobby Sands died on hunger strike. As Joanne's husband told the Irish Independent last week, everyone knows about Bobby Sands, but who remembers Joanne? 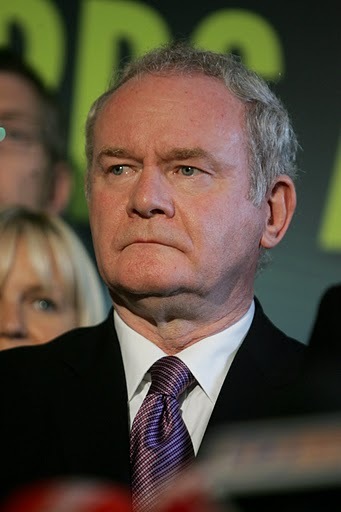 Martin McGuinness -- our possible future president -- still lives about two miles from where Joanne was shot.